IBM just reported mixed first quarter earnings for 2012. GAAP earnings came in at $2.61, up 13 percent with non-GAAP earnings at $2.78, up 15 percent. Revenue was flat for the quarter coming in at $24.7 billion, up 1 percent adjusting for currency. Analysts expected $2.66 a share and $24.82 billion in revenue. Net income for the quarter came in at $3.1 billion, up 7 percent from last year. “In the first quarter, we drove strong profit and earnings per share growth. We delivered another excellent software performance, expanded services margins, and continued the momentum in our growth initiatives,” said IBM CEO Ginni Rometty. “Our investments in growth market countries continued to generate strong revenue growth across software, hardware and services while contributing to the company’s ongoing margin expansion. The company said that cloud revenue doubled first-quarter 2011 revenue. Revenues from the Software segment were $5.6 billion, an increase of 5 percent compared with the first quarter of 2011. Revenues from IBM’s key middleware products, which include WebSphere, Information Management, Tivoli, Lotus and Rational products, were $3.5 billion, an increase of 7 percent. 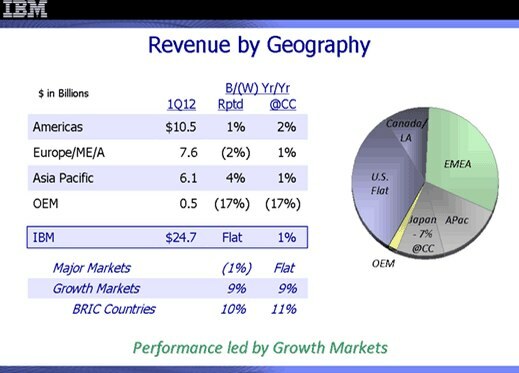 Global Technology Services segment revenues increased 2 percent. Global Business Services segment revenues were down 2 percent to $4.6 billion. The company ended the quarter with $12.3 billion of cash on hand. The quarter has been mixed for IBM. While the company revealed layoffs in February, IBM has spent some cash in the first quarter on acquisitions, buying Worklight for $70 million and Green Hat. Big Blue also sold 750 patents related to networking, software and other technologies to Facebook. 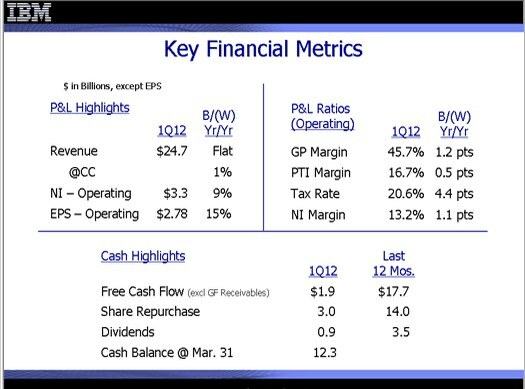 IBM actually raised expectations for full-year 2012 GAAP diluted earnings per share to at least $14.27 from at least $14.16; and operating (non-GAAP) diluted earnings per share to at least $15.00 from at least $14.85. During the earnings call today, IBM said that it spent $1.5 billion on acquiring five companies in the quarter.